I stumbled on a blog post over at Vintage World Rocks on "How to Start Your Own Online Vintage Shop." I read it with interest, and then I had a good laugh at myself as I recalled how I pretty much did the opposite of everything she suggests. All of her advice is genuinely good advice, and I'm not laughing at her — I'm laughing at me. 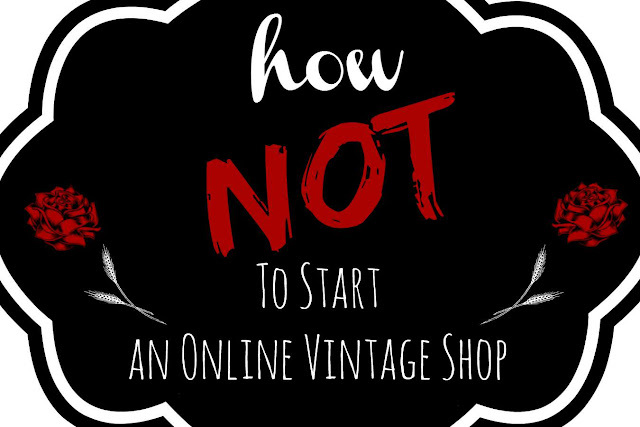 I thought I'd offer you guys a peek at the decidedly haphazard way I went about opening my Etsy store in a post I'm calling "How Not to Start an Online Vintage Shop." Learn from my mistakes, people! Look at other shops and think, "I can do that! That's easy!" The real reason I opened my shop in the first place was that I felt like I was constantly seeing things selling for $20 that I could buy at my local thrift store for $2. On the one hand, I was right. But on the other hand, I had no concept of the amount of work that would be required to actually get items out in front of people, and make consistent sales. 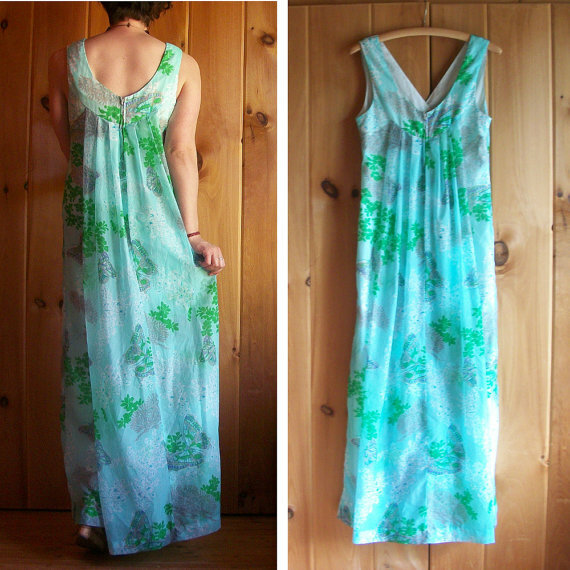 The first item I ever sold on Etsy! I opened my shop with, literally, five things in it. And then I sat back and waited for them to sell, because I figured they would. I STILL HAVE ONE OF THOSE FIVE THINGS IN MY SHOP. The amazing thing was, I did actually make a sale within the first few weeks of opening my shop, which baffles me to this day. But obviously that kind of dumb luck can't be counted on. I mean, why WOULDN'T you want to buy this necklace? I'm not going to say I didn't put effort into the first photos I took for Etsy; I did. But they were still absolutely awful. I shot them all during my daughter's naps, in her nursery, which has by far the worst lighting of any room in my house. And I used my old, lousy cellphone to do it. My photos still leave a lot to be desired, but once I started to be more conscious about lighting, focus and post-processing, I was able to make them a lot better. In general, I am very confident in my ability to tell if something's vintage, but when it comes to narrowing things down to a specific date range, I often balk at doing the necessary research. 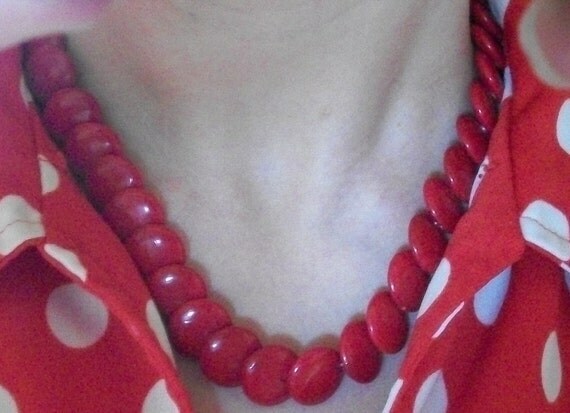 On the occasions when I have, it's paid off, as it did with this Elsie Krassas dress. This was the first banner I ever designed for my Etsy shop, using GIMP. Totes profesh. When I opened my Etsy shop, it was under a different name: bon marche couture (that's right, all lowercase, because I was cool like that). I will say that I at least did enough initial research to see that the name wasn't being commonly used. But it was also hard to spell, pronounce and remember — none of which is good news for a brand. And when I re-branded, I did so really haphazardly, because, as this post makes clear, I tend to get really excited and rush into things. But even though I made lots (LOTS) of mistakes ... it was okay. And that's my point in writing this post: You shouldn't feel discouraged if you don't have the time, energy or resources to build up a huge inventory, craft the perfect brand and build a professional-grade photo studio. You can still do it, even if it's on a shoestring, or in teeny tiny little moments of "spare time," or without the best equipment. (Even if dogs photobomb you with their butts when you're trying to take product shots.) It's kind of like deciding when to have a baby: If you wait for the perfect time, it's never going to happen, because there is no perfect time. So just go for it! I did, and I'm so glad. Loved reading your "mistakes". I've made some similar ones... but it seems like you must be doing something right because your shop has had many sales. Also, I think one of the best things that you have going for you is that you have an eye/instinct for what's trending and coming back in style. For example, when I look at your thrift store haul posts there are at least 1-2 pieces per post that are almost identical to the brand new inventory where I work. I struggle with getting excited and rushing into things as well. Sometimes it can be annoying but I suppose its better than over analyzing and never getting started. I love the re-branding you did on your blog, by the way! Looking forward to watching the concept develop. I like the way your shop is arranged by colour, but relatively haphazardly in terms of items / age within that. It's really pleasing to look through, and gives the impression of care taken, without over-curation. Thanks! I've struggled with how to organize it, and am considering creating categories based on size now that I have a larger inventory - but I do really like the visual display of having things arranged by color. I will freely admit that I stole the idea from the many other Etsy sellers I saw using a similar layout! 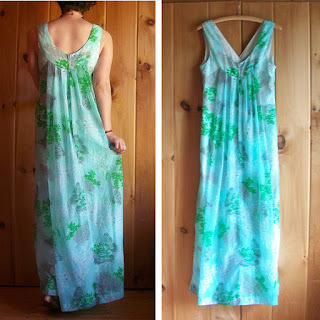 I cringe going through my Etsy sale records and seeing how I used to photograph my clothes directly in front of a window.. with light flooding in and nearly blinding my camera. How I made my first sale is beyond me. I loved this post a lot and found it VERY relatable. Thanks for sharing your mistakes, Emily!